Eggless Maple Walnut Cake - Wholly Delish! This is a cake I made for my mother-in-law who is a Lacto-vegetarian and who could likely subsist solely on tea, toast and her favourite ice cream. I’ve experimented in the past with eggless cakes and have concluded that rather than fussing too much with finding eggless recipes, I can simply substitute a combination of apple sauce and flax egg in any cake recipe with decent result. It works best in recipes that already call for buttermilk or yoghurt as they end up with a better spongy cake texture. In this case, I took my inspiration from this recipe at Taste of Home blog. 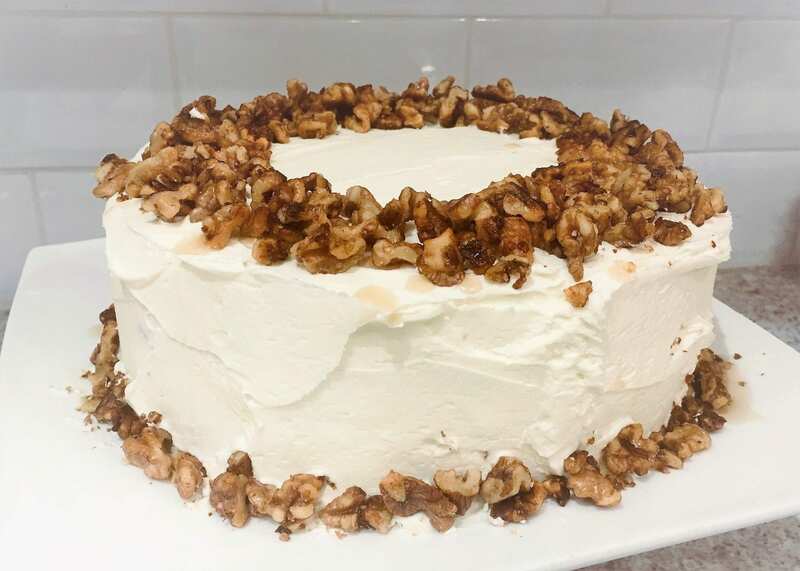 This Eggless Maple Walnut Cake was a huge success! We all loved it (including my little boys). The cake was moist and spongy, and the candied walnuts provided a delicious crunch. The buttercream had just a hint of maple to really tie it all together. Plus, it looked good too (in my humble opinion)! It served well as a birthday cake for a grown-up and would make a great potluck dessert as it holds together really well after pieces are cut away and still maintains its appearance. Give it a go next time dessert is called for! Preheat oven to 350°. Begin by making the cake batter. In a stand mixer (or large bowl using electric beaters) cream together butter and sugar. Add maple syrup, flax eggs and apple sauce and mix well. Mix dry ingredients in a bowl and slowly add to batter alternating with yoghurt. Line two cake tins with parchment paper, or grease well with oil or butter. Divide batter evenly between the pans and bake until set in the middle (12-15 min). Meanwhile, toss the walnut pieces with maple syrup and salt in a small bowl. Spread on a greased baking sheet and bake with the cake until toasted. Remove cakes from oven and cool 10 min in pan. Remove from pans and cool completely on racks. While your cakes are cooling, prepare the icing. In your mixer (or with electric beater) beat teh butter until light. Slowly add the icing sugar and maple syrup and beat until light and holding peaks. Add cream as necessary to achieve a spreadable texture (you may not need any). To assemble the cake, place on cake layer on your serving plate. Top with 1/4 inch layer of buttercream icing and sprinkle with half of your walnuts. Place the second cake layer on top and carefully ice the sides and top of cake with a thin layer of icing (removing excess as you go – this is just the crumb layer). Cool in refrigerator until set. Use remaining icing to cover the sides and top of cake and top with remaining walnut pieces.